Quinns: What are you doing RIGHT NOW? Swallow that food! Drop that baby! We’ve found a board game you should buy. It’s kind of what we do around here. 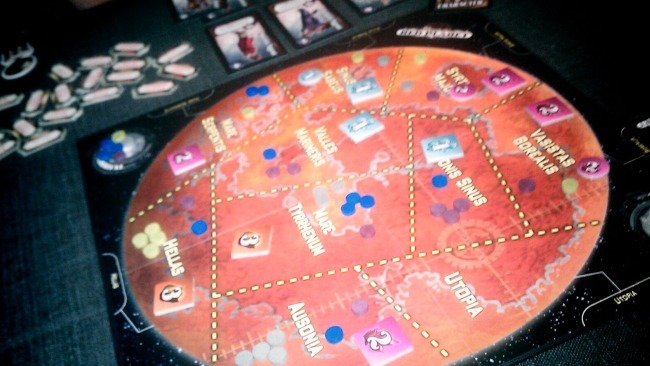 is a game of racing to colonise Mars in a congenial, steampunk fashion. 3-5 players jostle to load their tiny astronauts into ships on the launchpad board, these land them on the planet board, and you all try and dominate regions and fulfill secret objectives in a game of area control. That’s the idea, anyway. It’s probably written on a post-it somewhere in mission control. Mostly, you ‘ll be looking at your private hand of character cards, from which you must play one card each turn. And oh no. Oh no. You’re turning pale. You’re trembling. Opposite you, a player throws up in his mouth a little bit. 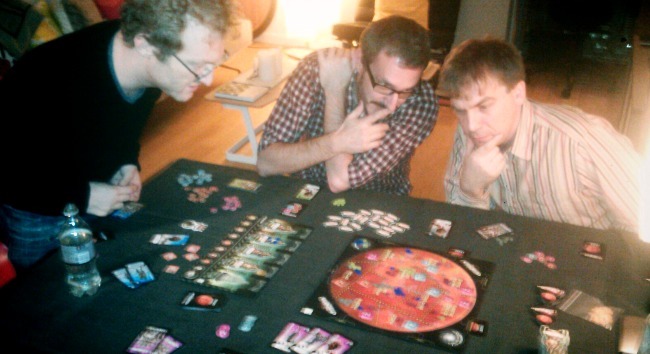 It takes 5 minutes to explain Mission: Red Planet, after which you and your friends will blast off in a game lasting 10 turns, and built from 10 excruciating decisions. GUYS, I SAID EXCRUCIATING DECISIONS. Here’s how it plays! The game has two boards, one showing rockets, the other showing Mars. Players drop astronauts into these rockets, like nickels into slots, with each rocket blasting off towards its preset destination the second it’s full. Once astronauts arrive in a region on Mars you’ll find out how valuable it is by turning a token face-up. At the end of turns 5, 8 and 10, whoever has the most astronauts in that region gets as many points as the region’s worth. And then you see that hand of character cards everyone has to select from each turn. I’d recommend you explain the game before handing these to their friends, just to see their faces contort like decaying fruit as they thumb through them. Your nine pointy characters replace your fingers, forcing you to play the game with Edward Scissorhands’ own lacerating touch. Take no. 4, The Secret Agent. He loads two astronauts into two separate rockets, then forces any one rocket to leave early. Get the picture? Or no. 5, The Saboteur, who loads one astronaut into a rocket, then blows up a rocket on the ground. Imagine all those broken corpses on the launchpad. Imagine your friends’ mouths and body language snapping closed like mousetraps. Think you’ve worked out who you want to deploy? Whoah there, youngster! We’re not finished. Rockets that leave (or explode) are only replaced at the end of each turn, and character cards are played in numerical order. First, anyone who chose to play the terrible Recruiter (no. 1) gets to move, and so on. So, the better the card you play, the greater the chance everyone else will fill up (or break) the rockets before you get there. In other words, it’s a deft execution of risk/reward. 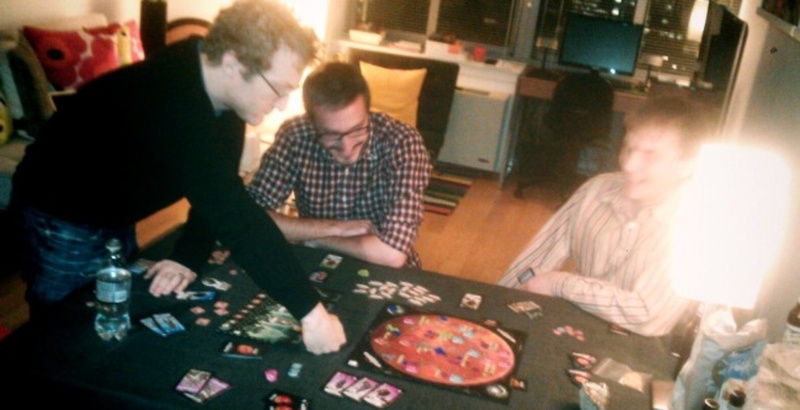 Successfully squeezing men into spaceships has people at the table hollering like NASA’s most easily-impressed employees, while losing a turn is agonising. Embodying all of this is card no. 7, The Travel Agent, who lets you place a whopping three astronauts in one ship. Exactly one ship. If there’s not room for all three guys, they all have to stay home. THE TERRIBLE PAIN. But every one one of these character cards is just that thrilling. The Explorer lets you shift your astronauts about on Mars, changing the game to the soundtrack of all the other players groaning. The Femme Fatale sees you placing an astronaut, and replacing an astronaut in another rocket with one of your colour, chipping away at whoever you perceive to be in the lead. The Soldier’s more vicious still- all the way at the back of the pack at no. 9, he’ll let you place two astronauts of your colour, and kill one that actually made it to the planet. BANG. Get off my martian lawn. 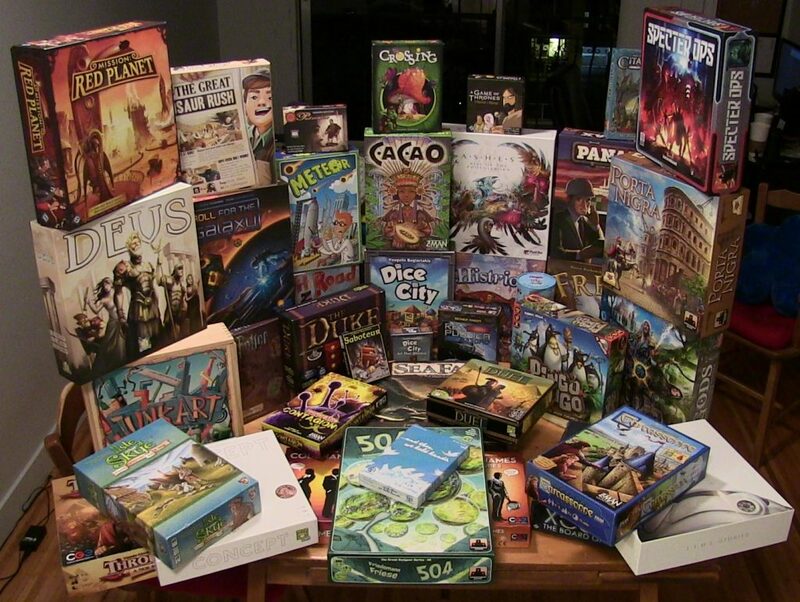 The longer myself and Paul play board games, the more we appreciate elegant design. We like maximalist nonsense as much as the next nerd, but the stuff that makes us swoon? It’s the designers that twist just a few rules together like a prisoner assembling a shiv. 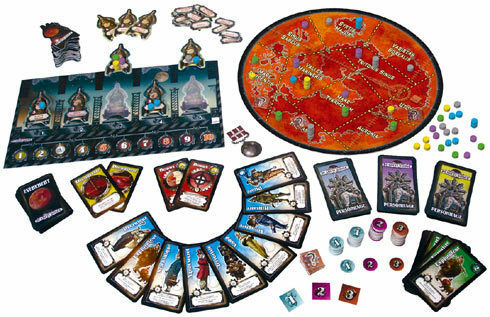 Mission Red Planet is your actual box of shivs, because the entire game is built from materials that are either apparent or instinctive. You’ll hold your breath as the rockets on the launchpad fill up (or blow up), clasping your chosen card, waiting impatiently for your turn. You’ll bite your nails as you watch various regions of Mars fill up, the area control subgame as hypnotising as it is simple. 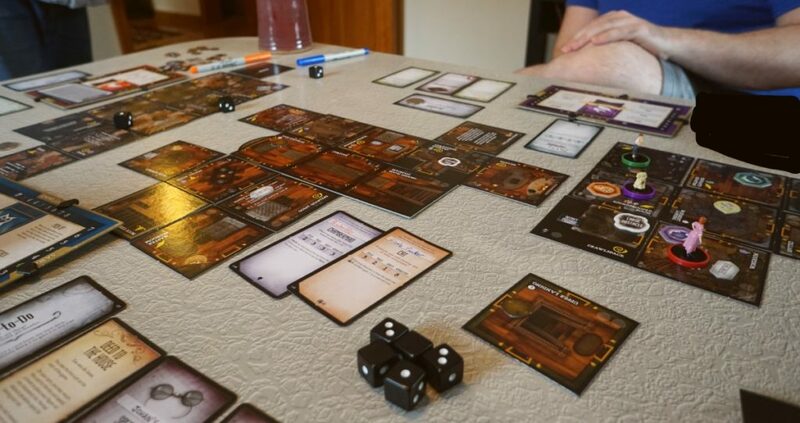 Because to get a bit technical for a second, the game’s basic objective of trying to move tiny bits of wood from A to B lends it a striking immediacy. A glance at the board can show you whether you’re doing well. On every turn when you manage to get all of your astronauts onto the sodding planet, you’ll thrill. Every turn when your opponents fail to get theirs into orbit, you’ll thrill. I can’t recommend Mission: Red Planet enough. It’s not as grin-inducing as a Cvatil game, or as rich as a Rosenberg, because it’s providing the other thing. Mission: Red Planet is a lovely object, it takes minutes to learn, and the payoff for your tiny investment of time is a game that’s fun for every single one of the forty minutes it lasts. Wonderful.